47 mm grade 2 titanium case, 17.20 mm thick, smoky sapphire back with city indication for each time zone, 5N 18K rose gold bezel, double antireflective smoky sapphire crystal, smoky openworked dial with sapphire and finish with transferred nautical flags as hour markers, 5N gold-toned hands with superluminova, caliber CO 637 automatic movement with hours, minutes, sweep-seconds hand, 2nd time zone, city indicator, approximately 48 hour of power reserve, black vulcanized rubber strap, triple-blade folding buckle. Water resistant to 100 m. (Old reference 637.101.05/F371 AN01). 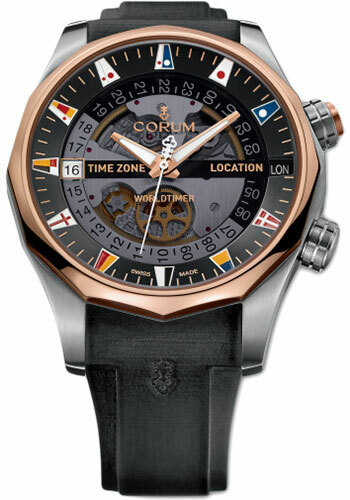 47 mm grade 2 titanium case, 17.20 mm thick, smoky sapphire back with city indication for each time zone, double antireflective smoky sapphire crystal, black openworked dial with transferred nautical flags as hour markers, rhodium-plated hands with superluminova, caliber CO 637 automatic movement with hours, minutes, sweep-seconds hand, 2nd time zone, city indicator, approximately 48 hour of power reserve, black vulcanized rubber strap, triple-blade folding buckle. Water resistant to 100 m. (Old reference 637.101.04/F371 AN02).